Volkl's Shiro is unquestionably a powder specialist, built to thrill in steep, deep, and preferably expansive Big Mountain terrain. Objectively and subjectively I noticed the Shiro's size right away—a hefty 119 millimeters underfoot. Even at the 170-centimeter length I tested, the Shiro feels big, water ski big, like pontoons on your feet big, and all that size translates directly into incredible flotation. The Shiro makes a little bit of fresh snow feel like a lot, and it makes uneven or chopped deep snow feel smoother. On-trail, the Shiro delivers a nicely neutral ride. Edge grip is credible even on harder snow, making for surprisingly well-behaved in-bounds performance. But who really wants to be riding this ski on groomers? You get the Shiro for powder, and if you don't have powder, you get something else. In this age where skiers are (once again) increasingly prizing versatility, and makers are increasingly delivering it, the Shiro's extreme level of specialization is starting to look a little anachronistic. Ideal Shiro riders these days fall either into the category of those who own large quivers of skis, to fine-tune the plank to the day, or else those who ride powder as if it were a religion, and otherwise tend to stay home. I'm not dismissing the Shiro's appeal to either group of skier, but I do think that for the more typical rider, who is going to own at most two pairs of skis at any given time, if even that, the Shiro offers too limited a range. That's especially true for lighter skiers who just don't need this much flotation. Drop down to the 108-millimeter width class, and you can take your pick of powder-tilted All Mountain skis that will run circles around the Shiro on groomed snow. 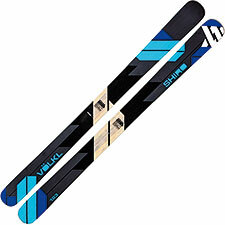 That said, within its class, I don't hesitate to pronounce the Shiro one of the very best of the super-wide powder skis. Performance in this category is really all about the feel of the ski as it sweeps through deep snow, and the Shiro feels great—smooth and slinky and tasty. It rises to the level of the unquantifiably special, and if that's what you're looking for, the Shiro is worth a long look.